The tough but attractive Phat Water Pro-Flo white faucet is the choice faucet for all our undersink filters and reverse osmosis units where you want white to blend with the rest of your kitchen. This stylish White Faucet will make any kitchen come alive with it's stylish looks. Why be like everyone else with the standard faucet when you can stylize your kitchen and blend with your kitchen needs. The spout swivels 360 degrees. 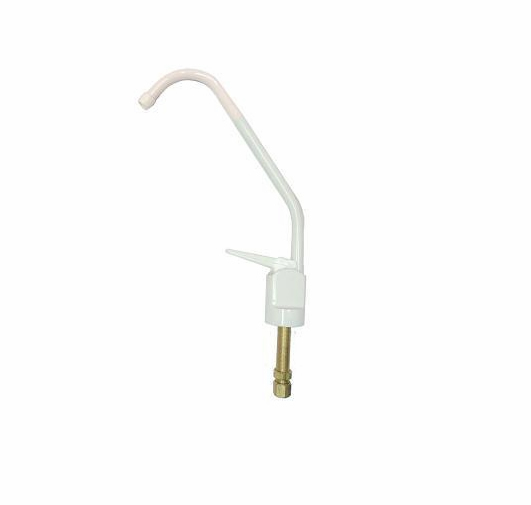 The Phat White Faucet is easy to install with preinstalled 1/4" tubing and complete accessory parts and instructions. * NSF approved ANSI NSF Std. 61. * Lead-free brass faucet body. * Preinstalled 1/4" inlet tubing. * Self-closing handle with lock-open feature.